Performance Accessories Body lifts are designed to lift a vehicle by placing 2" or 3" blocks between the body & frame. Performance accessories lift block's are constructed of a high grade reinforced nylon block, and the hardware is all grade 5 zinc plated for maximum strength and corrosion protection. Looking to lift your truck or suv but don't want to break the bank? 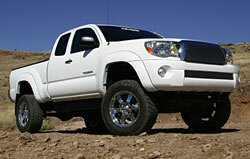 Check out a body lift kit from Performance Accessories or Daystar! These kits are available in 2" and 3" size and are priced right. WHAT IS A BODY LIFT KIT? 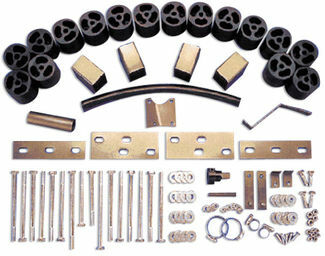 These are kits that are designed to lift your truck or suv by installing 2" or 3" high grade nylon spacers between the body and frame of your truck or suv. 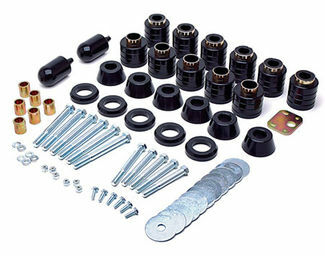 All kits are custom fit for a specific vehicle and include extended high grade bolts that replace the factory body mount bolts which allows for the nylon spacers along with any required brackets or hardware. Because the suspension is not changed ride quality will remain the same and new extended shocks are not required. PRO & CONS OF A BODY LIFT KIT VS A SUSPENSION LIFT KIT? Many customers have trouble decided if a body lift or suspension lift kit is best for them. To help make the decision easier below are the pros and cons of both methods of lifted your vehicle. A common complaint with body lifts is once installed the frame is more visible and gaps can be seen within the fender wells. Performance Accessories addresses the gap issue with optional custom fit body lift gap guards made of durable urethane. Also, while most body lift kits included everything you will need to properly install a few applications do required a steering extension to be purchased as an option.